Lt. Brad Snyder lost his sight in an IED explosion in Afghanistan last year. 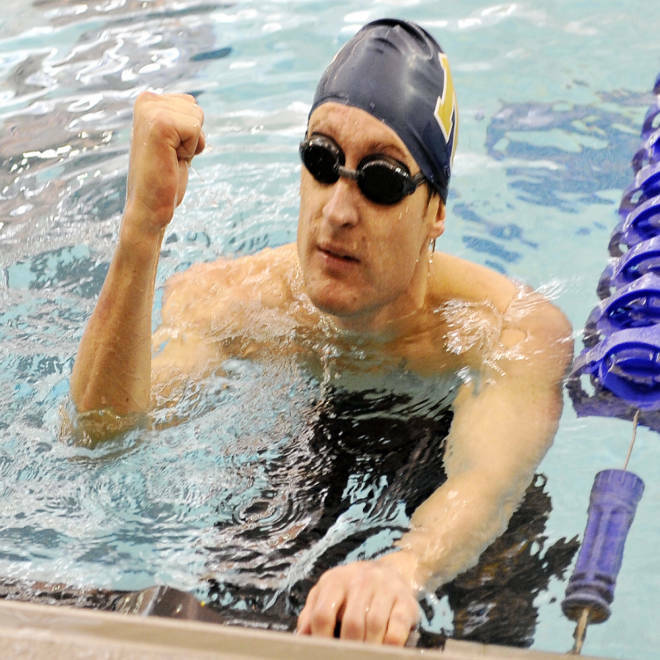 The Navy officer will once again represent the U.S., this time at the London 2012 Paralympics. The man who views only black today is visualizing all the colors of his London swims. In his mind, he sees the aqua-blue pool frothy with wakes, the home stretch of the lane lines painted red, and the dark, wide mouths of roaring fans. Behind prosthetic blue eyes — replacements for the natural pair he lost after an explosion in Afghanistan nearly a year ago — Navy Lt. Brad Snyder soaks in the scenery of a dream realized. The 2012 Paralympics open today in Britain. Snyder races for gold Friday. Already, though, he can glimpse a distinct, happy glow. “During the Olympics, I read about the races, about (Michael) Phelps and (Ryan) Lochte and Missy Franklin. I heard the commentary and used that to pull out the details to produce this image,” Snyder said. “But instead of reading about Lochte, I just implanted myself in there. As an elite athlete — among blind swimmers he is No. 1 in the world at three freestyle distances (50-, 100- and 400-meters) — Snyder draws such mental pictures as a preparation tool. As a result, nothing in or around the London pool, he said, should feel unfamiliar. But in a life being rebuilt after severe injury, this ironic tactic is simply how the man endures. The bright side is never far off. But total darkness came in a single stride. On Sept. 7, 2011, the former Navy bomb defuser was rushing forward to help two Afghan soldiers wounded in an initial IED blast. In his dash, Snyder stepped on a second hidden bomb in an irrigation ditch spanning a farm field. His eyes were irreparably damaged by the detonation and later were removed by a surgeon. Once a member of the Naval Academy swim team, Snyder returned to the water about a month later — this time, seeking a familiar, soft place in a world suddenly filled with surprise, hard edges. The warm water also rekindled an ultra-competitive, inner furnace, driving Snyder to begin training in Baltimore with Brian Loeffler, head swimming coach at Loyola University. His new goal: earn a spot on the U.S. Paralympic swim team and compete at the world’s second-largest sporting event, the Paralympics. He punched his London ticket in June after a series of spectacular sprints at the time trials in Bismarck, N.D. He strolls into London’s Olympic Stadium today with 226 other disabled American athletes — one of 20 active or former service members on the U.S. team, and one of six wounded during combat in Iraq or Afghanistan. Yet each teammate also is an accomplished athlete who outperformed hundreds of Paralympic hopefuls to make the cut. For context, simply peruse two of Snyder’s post-injury times. In the 50-meter freestyle: 26.54 seconds — better than 10 Olympians who swam in London; and in the 100-meter freestyle: 57.75 — quicker than three 2012 Olympians. The 100-meter free on Friday offers Snyder his first crack at a medal, and it unleashes an aggressive schedule of seven events over nine days. In addition to his three world-best times, he’s currently ranked No. 2 among blind swimmers in the 100-meter butterfly and No. 4 in the 200-meter individual medley. For each event, Loeffler works as Snyder’s “tapper,” using a walking cane to touch Snyder’s shoulders to alert him that the wall is near and that a flip turn or final push is required. For Snyder, his coach and his family, that is the race of races, scheduled for Sept. 7 — exactly one year to the day he stepped on the bomb. All of the people who huddled near that bed last September at Bethesda Naval Hospital outside Washington, D.C. will be in the crowd in London — his two brothers, his sister, an aunt and his mother — who calls herself “a weeper” and who fully expects a gush of tears, win or lose. “From getting the phone call that morning from his commanding officer to not knowing what we were about to go through to what we went through the past year and then to see all that he has accomplished, well, it’s going to be amazing,” Valarie Snyder said. “He shared something with me not long ago. He said that every little boy dreams of doing something great in their life in sports. If you’re a runner or a swimmer, you dream of one day going to the Olympics. But when you grow up," she added, "you realize that was just a dream."